english name "European Gemmed Amanita"
The cap of A. gemmata is 50 - 100 mm wide, oval to hemispherical at first, then convex to plano-convex, finally slightly depressed at the center, moderately grayish yellow to light yellow, with a somewhat darker center, viscid when moist, glabrous, with a tuberculate-striate margin. The cap is scattered with soft, moderately thick to thin floccose patches or warts, variable in size medium to small. The gills are free to remote, whitish to pale cream, and broadest near the middle. The short gills are truncate. The stem is up to 110 × 10 mm, gradually tapering upward, stuffed then hollow, white, with cracked to appressed scaly belts. The volva is present s appressed scales or small floccose warts near the apex of the bulb. The spores measure 8 - 10 × 6.5 - 7.5 µm and are inamyloid and ellipsoid to broadly ellipsoid. Clamps are infrequently present at bases of basidia. Neville and Poumarat (2004) state that this mushroom is distinguished from Amanita gemmata (Fr.) Bertillon in Dechambre only by its greater size. However, their information on the size of fruiting bodies of the present taxon and the size of fruiting bodies of A. gemmata indicate that the ranges of cap width, stem length, stem width at the top, and stem width just above the bulb for f. amici fall entirely within the corresponding ranges for the type form. This being the case, A. gemmata f. amicia should be considered a taxonomic synonym of A. gemmata. The same authors note that a substantial reason for the persistence of the present name has been its historic (repeated) misapplication to the muscarioid species now named A. gioiosa S. Curreli. Because of the Mediterranean distribution of the latter species (which is rather common within its range), the impression arose among some authors that f. amici might be distinct at species rank, that it was a dominantly Mediterranean taxon, and that it was much more common than was found by Neville and Poumarat, who consider it rare. Given the information provided by these two authors, RET proposes that the A. amici is a synonym of A. gemmata. 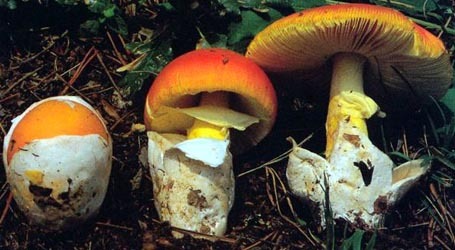 =Amanita gemmata f. amici (Gillet) E.-J. Gilbert. 1918. Gen. Amanita Pers. : 76. The editors of this site owe a great debt to Dr. Cornelis Bas whose famous cigar box files of Amanita nomenclatural information gathered over three or more decades were made available to RET for computerization and make up the lion's share of the nomenclatural information presented on this site. 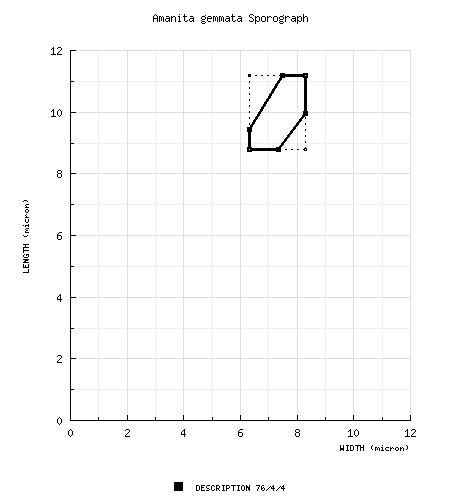 [76/4/4] (7.7-) 8.8 - 11.2 (-11.5) × (5.6-) 6.3 - 8.3 (-9.3) μm, (L = 9.3 - 10.5 μm; L' = 10.0 μm; W = 6.9 - 7.8 μm; W' = 7.5 μm; Q = (1.12-) 1.20 - 1.50 (-1.67); Q = 1.29 - 1.39; Q' = 1.35), hyaline, colorless, smooth, thin-walled, inamyloid, broadly ellipsoid to ellipsoid, infrequently subglobose, adaxially flattened; apiculus sublateral, cylindric; contents mono- to multiguttulate with some smaller granules; ?? in deposit. Neville and Poumarat (2004) state that this taxon is distinguished from Amanita gemmata (Fr.) Bertillon in Dechambre only by its greater size. However, their information on the size of basidiomes of the present taxon and the size of basidiomes of A. gemmata indicate that the ranges of pileus width, stipe length, stipe width at apex, and stipe width just above the bulb for f. amici fall entirely within the corresponding ranges for the type form. This being the case, A. gemmata f. amicia should be considered a taxonomic synonym of A. gemmata. The same authors note that a substantial reason for the persistence of the present name has been its historic (repeated) misapplication to the muscarioid species now named A. gioiosa S. Curreli. Because of the Mediterranean distribution of the latter species (which is rather common within its range), the impression arose among some authors that f. amici might be distinct at species rank, that it was a dominantly Mediterranean taxon, and that it was much more common than was found by Neville and Poumarat. Based on the information of Neville and Poumarat, RET proposes taxonomic synonymy of A. amici with A. gemmata. select a collection to review/add spore measurements..